Clitonville sit seven points behind North Belfast rivals Crusaders with four games to play. 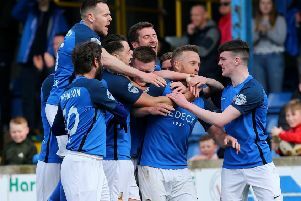 While it will take a massive effort from the Reds to overhaul both Glenavon and the Crues, McLaughlin says they have to have the ambition to do so. “You’re always wary of the teams coming behind you,” said the Cliftonville boss following their 4-2 win over sixth placed Coleraine. “You certainly don’t take anything for granted, not in any walk of life, and certainly not in football because it can come back and bite you quickly. “But you have to be ambitious and target the teams ahead of you. “We are all fighting for fourth place, but it’s not the end of the world if we don’t get it. “If we do get it then brilliant and it will be great testament as to how the boys have turned things around. “The boys have been superb. They’ve worked their socks off, you can see that on the pitch. “They show a lot of desire and heart for the club and desire to win points and do as best as they can. “What’s happened in the past is gone, we just want every player who comes in here to be proud to represent the club, and we want the fans to be proud of them and their club again. McLaughlin’s men certainly showed a lot of character to bounce back after twice falling behind at Solitude. The former centre half was disappointed with the goals his side conceded, but happy with the response of his players. “You always want to be keeping clean sheets and being defensively sound, but when it doesn’t go your way you have to respond,” he said. “If you respond in the right manner you can pull the game back, thankfully we managed to do that in the first half when we fell behind. “We responded really well and we responded positively. “The character of the team has been questioned over the course of the season and I think that’s unfair. “Over the last two weeks the character of the side has been brilliant. Coleraine boss Rodney McAree was left disappointed with the goals his side conceded, but he was pleased with the attacking ability they showed. “It’s disappointing we left here with nothing as I thought we were the better team going forward but defensively we could have done more and we have struggled in that department recently,” he said. “I thought we were more dominant in the air in the second-half. “Gareth McConaghie has come on and he’s had the disappointment of not starting the game, but I thought he was super and everyone improved when he was introduced. “In the second-half I can’t believe we haven’t scored.